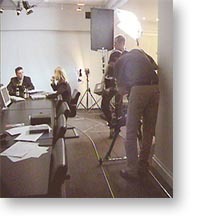 As a full-service production company located in Germany, we work on very different kinds of productions. From the one day ENG shot to the completion of very complex corporate films, commercials, documentaries, music clips and even smaller features. Our MICRODOLLY comes with us on all occasions, even if our clients didn't ask for it up front. 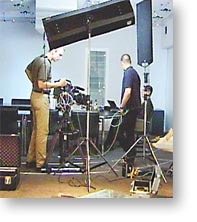 They always changed their minds every time we had shown them the easy set-up, the lightness and the great production value it adds to their productions, at a fraction of the cost of a large dolly. 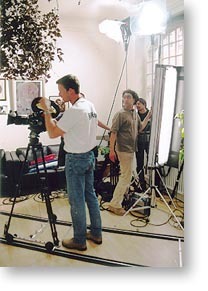 During one of our last films, the short feature "FOR SALE", shooting time and space had been important factors due to the practical locations we used on the film. We were only allowed up to a certain time in a real existing apartment. We shot scenes using a Panther dolly every time the dolly had to carry our heavy jib arm. This often caused problems in the small corridors and narrow stairwells the script asked for. So we tried to use our MICRODOLLY wherever it was possible, with great results. We were able to save a lot of precious production time by easily grabbing the whole Dolly Track and putting it into its new position. After seeing the rushes, no one was really able to distinguish the Panther shots from those made with the MICRODOLLY. The MICRODOLLY is a fantastic piece of equipment. Easy to set-up, lightweight but still very stable, it offers most of the possibilities of much more expensive items and adds production value even on shots with the tightest budgets.